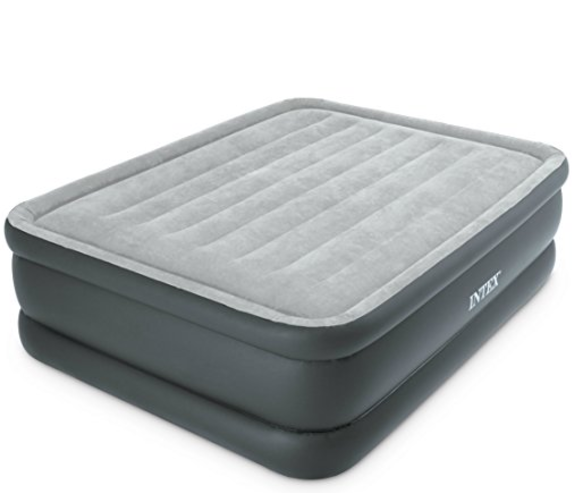 Today only, while supplies last, get this Intex Dura-Beam Standard Series Essential Rest Airbed with Built-In Electric Pump, Bed Height 20″, Queen for $34.99 (Retail $84.99)! Part of the new dura-beam standard series of airbeds, the essential rest airbed now features an interior made with Intex innovative fiber-tech construction which is comprised of thousands of high-strength polyester fibers that provide enhanced comfort, stability and support. The essential rest queen features a traditional bed height and cozy flocked mattress top so guests will feel right at home, and they will love the better support and firmness that the fiber-tech construction brings. The built-in electric pump plugs right into your standard wall outlet and inflates the bed in about 3-and-a-half minutes so there is no need to rummage through the garage for your old electric pump or fuss with tiring hand or foot pumps. Plus, it is loaded with features like the indented sides that help grip fitted sheets, the outer perimeter frame on both top and bottom that provides additional stability and support, and the dual chamber construction that provides ample vertical stability. This air mattress is raised 20 inch from the floor for convenience, making it easier to get on and off of than some air mattresses.